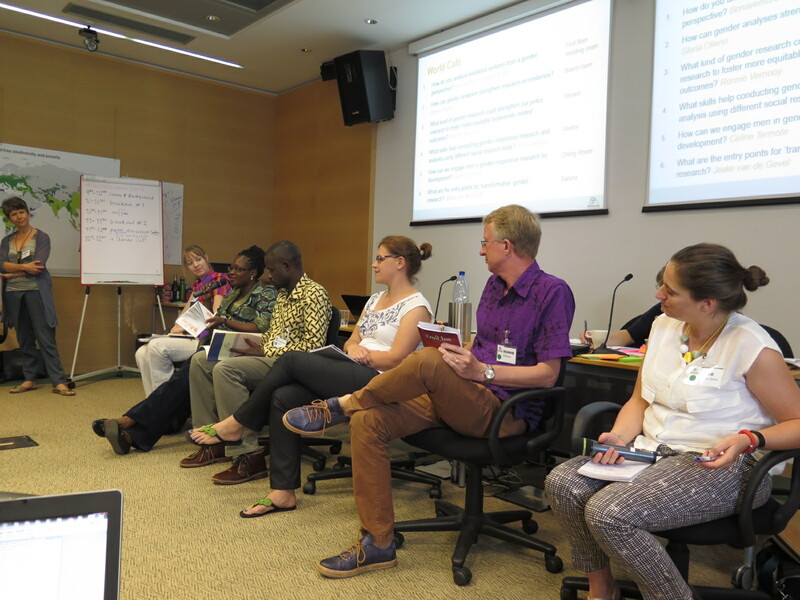 After so much planning, Science Week last week at Bioversity was finally a great opportunity to coalesce around the idea of improving our gender-responsive research practice and find out who might want to participate in the community. The first step was to get an overview of what is actually going on gender-wise across the organization. Marlene, Riina, Dietmar, Anne and I organized a session bringing together six very different researchers from different countries and research disciplines to talk about gender in their work. Six presenters went off to six different rooms World Cafe style, if not exactly a World Cafe format. Once there, they made a very short presentation and then discussed with the group. How can gender analysis strengthen research on resilience? Gloria Otieno, a Kenyan national based in Uganda working on climate change and genetic resources, community seedbanks and associated policy issues. How can we engage men in gender-responsive research for development? Céline Termote, a Belgian national based in Nairobi working on food and nutrition security, sustainable diets, nutrition-sensitive value chains, agroecology and ethnobotany. Once back in plenary there was a palpable sense of excitement in the room. It really does feel like we are launching the community at just the right moment. Having talked about it in the abstract for three years, and having discussed interest last year at Science Week already, it feels like now is the moment to ride on the wave of energy and start really interacting. People had no idea that there was so much good work going on! We will share the presentations (slides and notes) from the sessions among our CoP colleagues, as our joint repository takes shape. *Aman has not been at Bioversity long so his bio is not yet on the website.